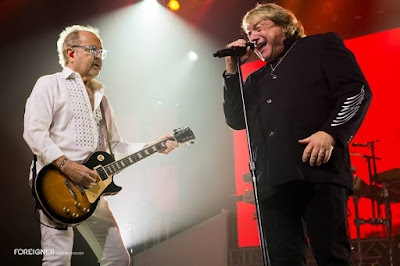 The original Foreigner lineup reunited over two shows in Mount Pleasant, MI on October 6 and 7 to mark the finale of the band’s 40th anniversary US tour, and video of the appearances have surfaced online. Original members Lou Gramm, drummer Dennis Elliott, keyboardist Al Greenwood, multi-instrumentalist Ian McDonald and bassist Rick Wills – who have previously appeared individually at various stops along the trek – joined band founder Mick Jones and the group’s current lineup during the two-night special event at the Soaring Eagle Casino & Resort. As the Michigan shows were recorded for a forthcoming 2018 TV special, DVD and album release, Foreigner delivered the same 18-song show each night over two sets, with Gramm appearing early in the evening with the group’s current members for an acoustic version of "Fool For You Anyway" from their self-titled 1977 debut. The reunion lineup took the stage for the start of a second set that saw them perform five classics from their first three albums: "Feels Like The First Time", "Double Vision," "Blue Morning, Blue Day," "Long Long Way From Home" and "Dirty White Boy." The group’s current players then returned as both lineups delivered encore versions of "I Want To Know What Love Is" and "Hot Blooded." Foreigner will begin an extensive Canadian trek in Calgary, AB on October 11.